'Dottie's Doll' (Anthony and Dorothy Willott, R. 2005). Seedling #W 97-5-9. MDB, height 5.5" (14 cm). Midseason bloom. 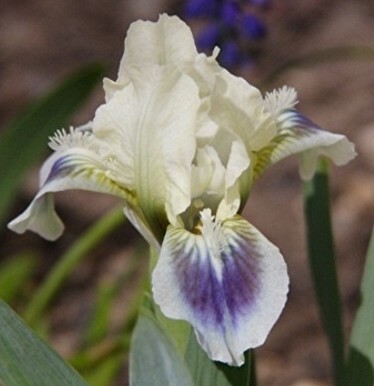 Standards and style arms very pale yellow; falls pale blue, large purple spot, nearly horizontal; beards white; ruffled. 'Ice And Indigo' X 'Little Drummer Boy'. Willott 2006.